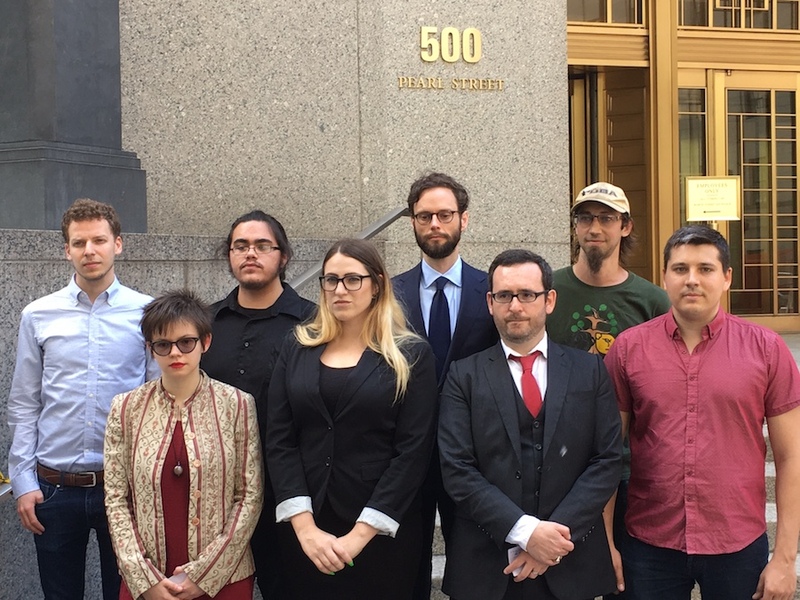 MANHATTAN (CN) – At an hour-long hearing Tuesday morning, the Second Circuit sent a loud and clear warning that New York City could face liabilities for police using sound weapons against protesters. Whether the officer who turned on the devices will have to pay is less clear. Six journalists and activists brought the lawsuit in question over their exposure to a sound weapon known as an LRAD during a December 2014 protest of Black Lives Matter at 57th Street and Madison Avenue. Short for long-range acoustic devices, LRADs originated as military technology to protect warships before migrating to civilian law enforcement agencies. Police claim that they deployed the device after a protester threw a bottle one of the officers, and demonstrators ignored commands to clear the busy intersection. After U.S. District Judge Robert Sweet moved the case to discovery last summer, only the individual officers appealed the ruling. Gideon Oliver, an attorney for the challengers, told the Second Circuit this morning that the demonstration was under control by the time that police activated the LRAD, pointing the device toward activists and journalists who had followed instructions to stand on the sidewalk. 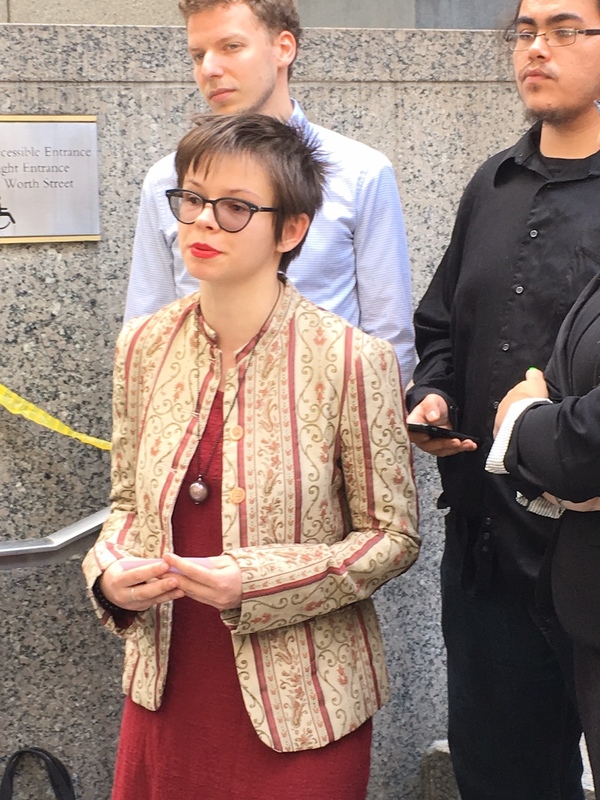 Attorney Ingrid Gustafson, who represents Lt. John Maguire and Officer Mike Poletto of the New York City Police Department, argued meanwhile that her clients would have no way of knowing that they could face liability for using LRADs for crowd control. “There is simply no law that would have put these officers on notice,” she said. While there is little precedent on LRADs, U.S. Circuit Judge Robert Katzmann likened them to flash-bang grenades. “This is acoustic weaponry, isn’t it?” he asked. Disagreeing, Gustafson said that the Constitution is clear on devices that explode. In the absence of clear precedent on these weapons, Katzmann asked why a jury should not get to decide the ability of the weapons to cause pain. The protesters who brought the lawsuit – led by photographer Anika Edrei – say that they sustained hearing damage. U.S. Circuit Judge Rosemary Pooler was wry about those downplaying its impact. “I have to agree with you that a sound device is better than bullets in terms of moving people,” she told Gustafson, the officers’ attorney. Of the three-member panel, U.S. Circuit Judge Robert Walker appeared to be the most skeptical that the protesters could prove their claims against the officers. Even the lawsuit had conceded that the officers received no training. “How are these officers to know that what they were doing would violate the Constitution?” Walker asked. Oliver, their attorney, replied that the dangers of the devices were clear from the label on the back. “A person does not need training to not drop a hairdryer in a bathtub,” he said. “But whether the individual officers should be personally liable for use of these LRADs seems to be a different question,” he added. Tuesday’s hearing ended without an estimate of when the panel will rule. The use of the XlOO as a projector of powerfully amplified sound is no different than other tools in law enforcement’s arsenal that have the potential to be used either safely or harmfully, one example being distraction devices-items like stun grenade, flash bang, or concussion grenades-which “detonate with a blinding flash of light and a deafening explosion” and whose purpose is to be”extremely loud” and distracting. Terebesi v. Torreso, 764F .3d 217, 236 (2d Cir. 2014). Finally, a judge has ruled police sound cannons are considered excessive force.